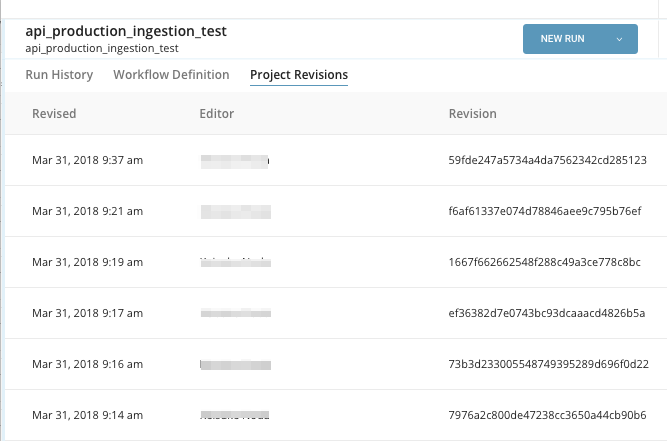 You can use the unique revision ID assigned to each workflow instance to revert to a previously saved workflow. Click the down arrow next to the New Run button and click ‘Customize Details.’ You see the workflow revision number. You might want to revert when a workflow is accidentally erased, overwritten, or when unwanted changes are made and saved to the workflow. A folder containing the workflow at the specified revision point is downloaded to current working directory. Note that the name of the workflow you are pushing to Treasure Data must match the name of the workflow that you want to revert. After issuing the push command, the workflow is updated to to the Revision ID specified in your download command.